The term ‘hot mess’ readily applies to ‘Glass’, whereby as muddled and hard to pin down as it is, it’s generally entertaining. Security guard David Dunn (Bruce Willis) uses supernatural abilities to track down Kevin Wendell Crumb (James McAvoy), a criminal and disturbed man with twenty-four personalities. Both David and Kevin end up in an institution alongside Elijah Price (Samuel L. Jackson) under the supervision of Dr. Staple (Sarah Paulson). 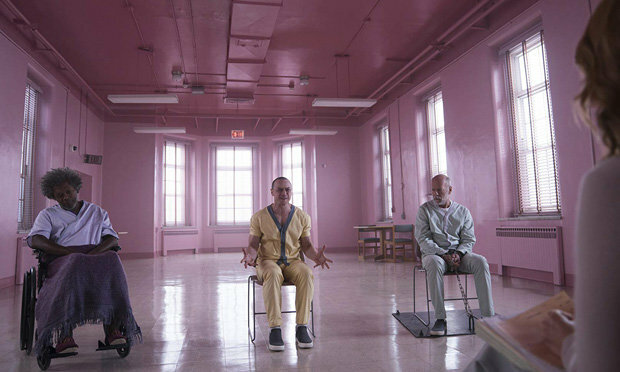 ‘Glass’ marks the fruition of a concept that writer-director M. Night Shyamalan has had in his head for about twenty years now. Things kicked off with ‘Unbreakable’, which saw Willis’ David discover his superpowers after meeting the mastermind Elijah, aka Mr. Glass. ‘Split’, which is essentially a straight-up horror-thriller that establishes McAvoy’s DID sufferer, followed. Thematically, ‘Glass’ is much more like ‘Unbreakable’, developing the themes and questions the 2000 superhero movie proposed, with its relation to ‘Split’ being little other than the inclusion of McAvoy and Anna Taylor-Joy’s characters. Both films are essential to appreciate or even understand ‘Glass’. As a standalone film, it’s feeble. The cinematography of ‘Glass’ is highly impressive thanks to DoP Mike Gioulakis (‘Split’, ‘It Follows’). The film is also strong when it verges into thriller-horror territory as is appropriate of the Blumhouse (‘Get Out’, ‘Split’, ‘The Purge’) aesthetic. Yet the film isn’t a horror, nor is it a thriller, and it’s hard to describe it as a superhero film either. You wonder if what you’re watching is some kind of drama or character study, and while some may appreciate the ambiguity, others will feel frustrated and simply disengage.